Brian Statham was a former english test cricketer and fast bowler who played for England in 70 Tests during 1951-65. He also held the record of highest wicket taker in Test cricket for some period. 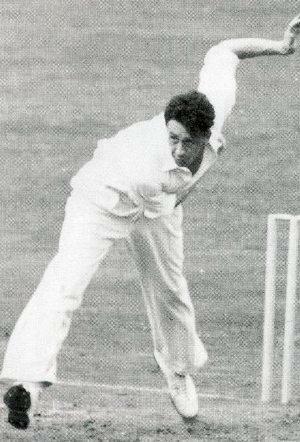 One of the greatest fast bowler of his time, Statham also had a long first-class career and played for Lancashire team. He was born on 17 June, 1930 at Gorton (Manchester, England) and died in 2000 at Stockport. Brian Statham started playing in Central Lancashire Cricket League for Stockport Cricket Club. He then made his first-class debut for Lancashire in 1950. He took 36 wickets in his debut season. His performance impresses the selectors and he made to the National Team. In 1951, he made his Test debut against New Zealand at Christchurch. He took ony one wicket in that match. In his next appearance for England when South Africa toured England that year, he played in the second and third Test and took four wickets. He then played in a five-match Test series against India in India. He took five wickets in the second test at Bombay including a bowling figure of 4/96 in India's first innings. But in the rest of the matches he didn't do well enough. In 1953, during West Indies tour he was in excellent form. He took six wickets in the first test. He again took six wickets in the third test including his best bowling figure till date of 4/64. He continued his form against Pakistan where he improved his best bowling figure to 4/18 in the first Test at Lord's Cricket Ground. In 1954-55 tour of Australia, he was one of the successful bowler in the series which England won by 3-1. In the third test, he took his first five-wicket haul. He had a bowling figure of 5/60 in Australia's first innings. In his next series against South Africa, he was paired with Fred Trueman. He bowled his best bowling figure of 7/39 against South Africa. During 1958-59 at Melbourne Cricket Ground, he had a bowling figure of 7 for 57 against Australia. In 1962, Statham overtook the record of highest wickets in test set by Alec Bedser. He held this record for a very limited period when his team-mate Trueman overtook this record. Though Statham has a very good Test record, but his first-class record is far better than that. He played for Lancashire in most of his career. In his debut season, he took 37 wickets (including one wicket in Test). In his next season he took 97 wickets with a bowling average of 15.11, six times taking five-wicket haul. His first 100 wickets in a season came in 1952. He topped bowling averages during most of the seasons. In 1957 season, he took his best bowling figure in a first-class match of 8/34 against Warwickshire. Statham has played 430 matches for Lancashire taking 1816 wickets with a bowling average of 15.12. Statham had also captained the Lancashire County team from 1965 to 1967, but he was not so much successful as a captain as the team performed poorly in these seasons. Statham has a bowling average of 16.37 in first-class matches which is best by any bowler in the world with more than 2000 first-class wickets.